Episode 5 of Un-go is fascinating on a number of levels. Like much of the series so far, it seems to be less interested in telling a mystery story than in developing a critique of society, or perhaps of human nature. We also get some interesting insights into Inga and the “defeated detective”, Shinjuurou Yuki. Hakurou Shimada, leader of the Rising Sun Party. 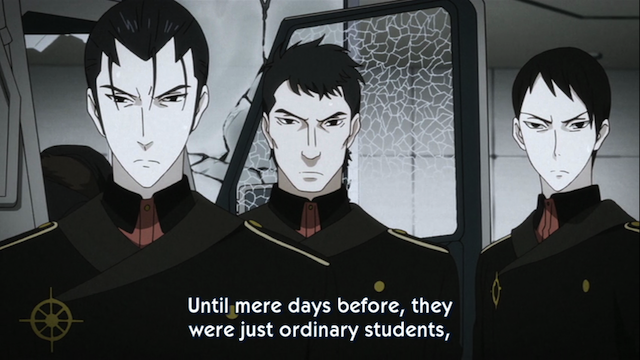 Three of Shimada's young followers who died for his cause. This episode was full of food for thought, and I highly recommend heading over to Hachimitsu for an interesting take that is informed by a reading of Sakaguchi Ango’s On Decadence. I’ll simply say that the Hakuro Shimada and his young followers remind me of Yukio Mishima and his young followers, the Shield Society. Mishima’s glorification of militarism, expressed in works such as “Voices of the Heroic Dead”, is echoed in Shimada’s cult of the fallen members of the Rising Sun party, and this is the source of contention for Shinjuurou Yuki, who doesn’t believe the lies that politicians use to consolidate power. People have given up their lives for others, but that doesn't say a damned thing about either one of us. The only ones who are admirable ... who are beautiful ... are the guys that died. Shinjuurou’s profound reaction to this issue seems important. 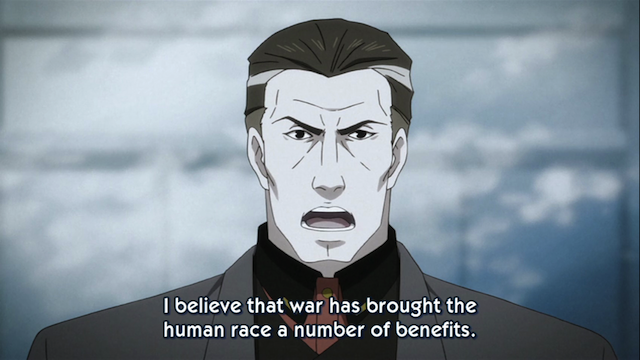 In one scene we even learn that Shinjuurou had some connection to “the young people who were the first victims in the war”. Shinjuurou seems to loathe himself at several times during the episode. He describes his own wish to stay alive as “petty, vulgar, and stupid”. He tells Rie that nobody should place their faith in him. Kazamori tries to trip him up in a logical conundrum, by showing that he acts altruistically, but tries to deny it. 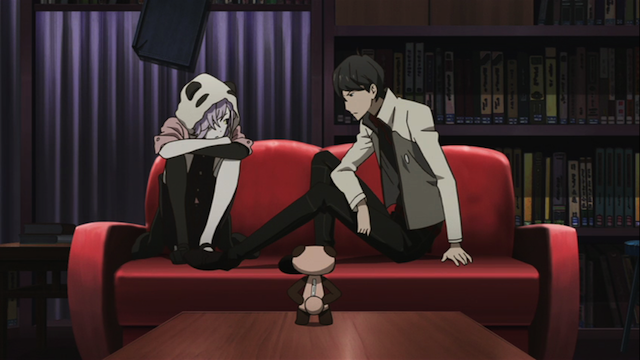 Inga (left) and Shinjuurou Yuki (right) sit on a couch, while Kazamori stands on a table (center foreground). We also get a short explanation of Shinjuurou and Inga’s relationship, which is a good thing, because episode 0 might take a while to get to reach those of us incapable of watching it on a movie screen in Japan. I’ve been very interested in what is happening here, so even a hint is helpful. Inga volunteers that Shinjuurou feeds him/her human souls in such a way that the humans aren’t killed — Inga consumes their Truth. 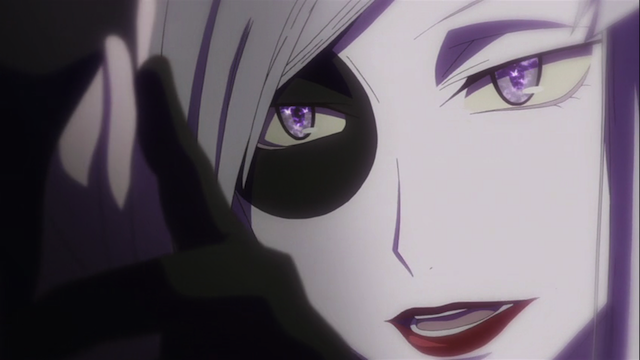 But as a result, Shinjuurou is haunted by Inga. Statue 1: Boy wearing bear cape. 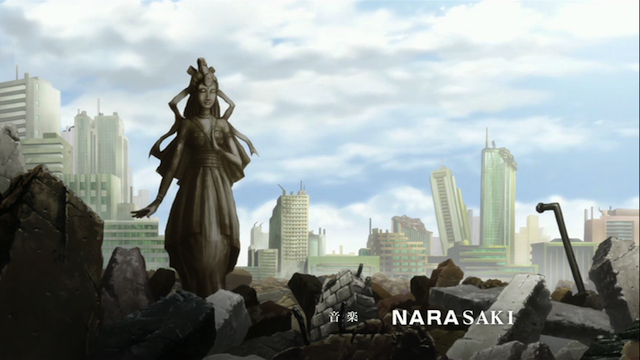 There are three interesting images of statues in the OP. The first two appear to be in the same place; there is rubble strewn about, and we can see a ruined cityscape in the background. To me, this pair of statues appear to represent the two sides of Inga. Statuary in a shrine deep in a cave. The third image is seen very briefly. There is a shrine deep in a cave. 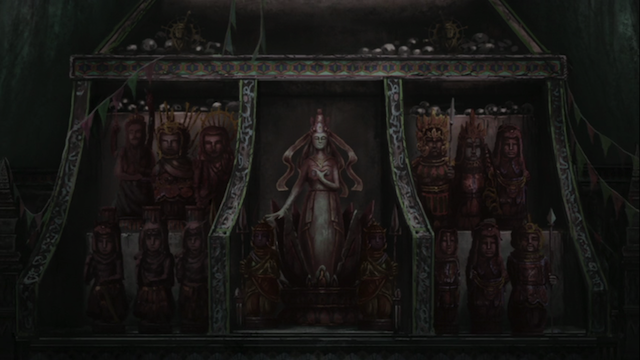 The shrine is covered in statues, but the central statue is clearly the same statue of a woman we can see above. Note the positions of the arms, and the ribbons flowing from the headdress. I would be very interested in learning more about what Inga is and what exactly caused them to team up. Hopefully we’ll see episode 0 some day. Haha I never paid much attention to the OP but woah. And yeah I’m liking it uptil now. It is interesting. 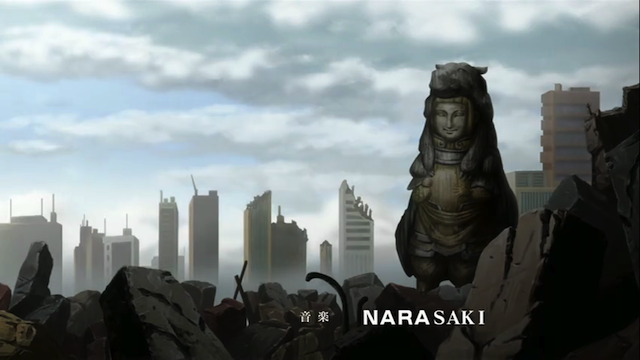 I happened to notice the statue of the boy with a fur cape and looked closer and thought, “that has to be significant.” After that I started noticing the other bits but they go by so fast that it wasn’t until I took some screenshots to compare that a theory emerged.
. I’ll simply say that the Hakuro Shimada and his young followers remind me of Yukio Mishima and his young followers, the Shield Society. Oh-Oh my. 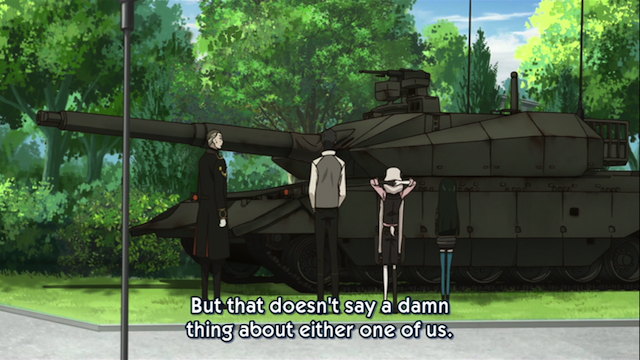 This explains the clashing ideals of Shinjuro and Shimada even more. I noticed the female statue is surrounded by other idols and one of them resembles the Virgin Mary, the others resemble Chinese warriors. I wonder what kind of deity these are. Yeah, Mishima was fascinating in a way that really screwed up people can be. I don’t know if he was an inspiration in the original story, or if the Bones adaptation brought it out, but this episode could be viewed as Shinjuurou arguing back to Mishima’s philosophy. On the shrine: that scene is so quick that is difficult to make much out of it, but I’m sure episode 0 will provide some details (if, and when, we get to see it). Yeah, I have a feeling that if Penguindrum weren’t airing, people would scramble over to find any hints of symbolism in UN-GO. I hadn’t thought of it that way, but I think you are right.